It’s a simple strategy that works because of how mortgage interest works. Unlike rent which is paid in advance at the start of a month, mortgage interest is only paid after it’s been borrowed. Your January mortgage payment, therefore, accounts for the interest that accrued in December. And for a lot of Lake Mary homeowners, that mortgage interest is tax-deductible. 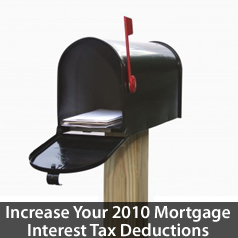 By making January’s mortgage payment in December, eligible homeowners can apply the interest paid to 2010’s tax returns instead of waiting to claim the same deduction against 2011. Don’t cut it close, though. It’s best to remit payment prior to the last week of the month, leaving your servicer ample time to receive and process your paperwork. Most importantly, though, before prepaying on your mortgage, talk to your tax professional. Not every homeowner is eligible for mortgage interest tax deductions, nor should every homeowner itemize their respective tax deductions. The “pay early” plan could be a wasted effort for you, ultimately, depending on your taxpayer profile. If you don’t have an accountant that you trust, call or email me anytime; I’m happy to make a recommendation to you.